Beautiful, absolutely stunning card. Thanks for joining us at ATSM. How beautiful! 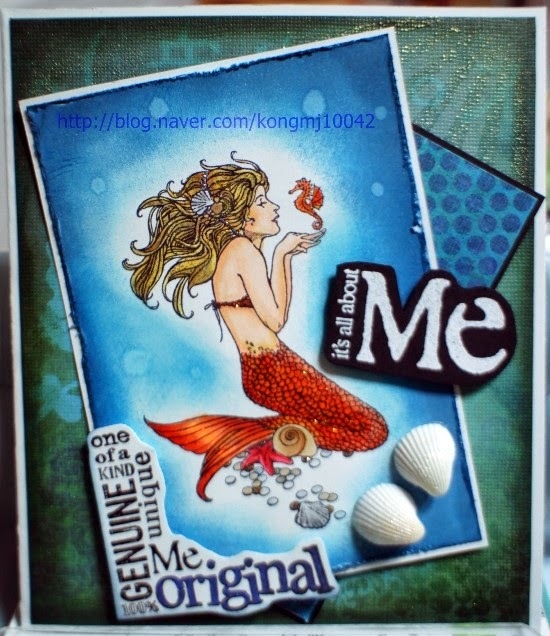 I love that mermaid image and your fabulous coloring! So happy you could join us at ATSM! 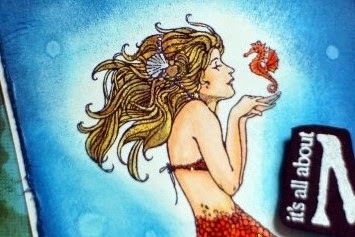 Love the mermaid, the inking around her is gorgeous!! Thanks for playing along with us at Addicted to Stamps and More!! I guess the twine is the little bit holding her top together! She is colored beautifully! Thanks for joining us this week at just Us Girls! I have this stamp.. never tried to color it.. knew I couldn't do it justice. Amazed here!! This is gorgeous! Thank you for sharing your card at Less is More although this week the challenge was to use opposite colours on a colour wheel and I'm not sure what you have used here. A wonderful card but as Sarah mentioned above, Less is More is all about clean and simple, with lots of white space. This is fabulous! Thanks so much for sharing it in our challenge this week. We are SO grateful to have you play along with us, and appreciate your participation. I hope you will join us again soon. P.S. You are ALWAYS welcome to share your wonderful art with us at Word Art Wednesday. It's always Anything Goes/Family Friendly and we have great prizes. It would be a blessing to have you play along with us.